ST. LOUIS, MO – Nov. 14, 2018 – Coolfire Solutions, creator of the Ronin Platform, a real-time situational awareness delivery platform designed for actionable intelligence, today announced the appointment of David Corsaut as Chief Operating Officer. 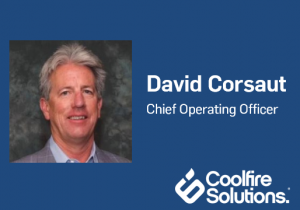 Corsaut brings more than 30 years of experience as a founder, senior executive, adviser and financier of global businesses to Coolfire Solutions. Corsaut, who is responsible for the day-to-day operations and overall performance of Coolfire Solutions, previously held C-level operational and financial roles across a broad array of industries including software, real estate, manufacturing, global logistics, e-commerce, transportation and venture capital where he performed detailed analyses of clients’ business models, leadership, corporate culture and financial performance. Establishing his career, Corsaut founded the financial advising company, Golden State Financial Group, where he specialized in M&A advisory for eight years and has since completed 100 successful acquisitions. Later, he served as COO of a global software services company where he raised more than $15 million in equity capital for its expansion, leading the acquisition team that acquired four companies and the integration of the acquired entities. Corsaut’s distinguished list of clients includes General Electric Co., Wells Fargo, Ernst & Young, Morgan Stanley and others. With a Bachelor of Science in behavioral psychology plus a range of graduate work in economics, accounting, finance and management, and the extensive network built throughout his career, Corsaut brings a steadfast, strategic approach to Coolfire Solutions and its market opportunities. Coolfire Solutions is the creator of the Ronin Platform, a real-time situational awareness delivery platform, built to integrate data from any source and transform it into actionable intelligence. Ronin was originally developed for the U.S. Military but is now being widely adopted by industry leaders such as Enterprise Rent-A-Car to minimize system gaps and improve operational efficiency. For more information, visit https://www.coolfiresolutions.com.